Berestycki's research interests include equation theory and the mathematical models of the financial markets; mathematical models in biology and in ecology; phenomena of invasion and dynamics of population growth; and modelling in social sciences. Bühler's research field is theoretical fluid dynamics and especially the application of asymptotic methods to atmosphere and ocean fluid dynamics..
Huang’s research interests are Partial Differential Equations and Fluid Mechanics. Ioffe’s research interests are Stochastic geometry of classical and quantum models of statistical mechanics; Phase transitions, phase segregation, interacting particle systems, metastability; Percolation, polymers and random walks in a random environment. Jiang’s research interests are probability theory and statistical physics. Kious’s research interests are Random Walks in Random Environment, self-interacting random walks and Processes with Reinforcement. Lin's research interests include classical and applied analysis, partial diﬀerential equations, geometric measure theory, and calculus of variations. Liu’s research interests are mathematics of fluid mechanics and control theory. McLaughlin works in theoretical visual neural science, with emphasis upon modeling of the primary visual cortex. The work requires methods from four aspects of modern applied mathematics (mathematical modeling, computational science, formal asymptotics, and mathematical analysis), together with direct use of experimental data and design. Professor Mertz’s research interests are applied stochastic analysis, random mechanics, reflected diffusions and nonlocal elliptic operators. His work has appeared in SIAM mathematical analysis, SIAM numerical analysis, asymptotic analysis, probabilistic engineering mechanics, IMA journal of applied mathematics, applied mathematics research express, comptes rendus mathematique and ESAIM: proceedings and Surveys. Normand’s research interests are coagulation processes, particle systems, and random matrices. Philippis' research interests are Partial differential equations of elliptic types, Geometric measure theory and its applications, Calculus of variations, and Minimal surfaces. Tarrès’ research interests are self-interacting random processes, particularly reinforced random walks, and their relationship with stochastic algorithms and learning processes in game theory. Prof. Wang’s current research interests are: Modeling and Simulations of Interface Problem and Multi-phase Flow; Numerical Methods for Micromagnetics Simulations. 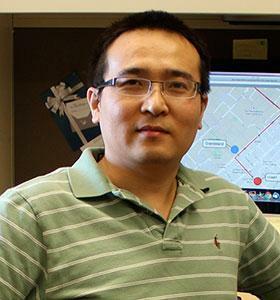 Professor Zhang’s research interests include the physics of ﬂuids, which covers biomechanics and bio-locomotion (organisms swimming, walking and ﬂying), geophysical ﬂuids (thermal convection, continental dynamics), solid-on-solid friction, and self-organized phenomena at different scales.